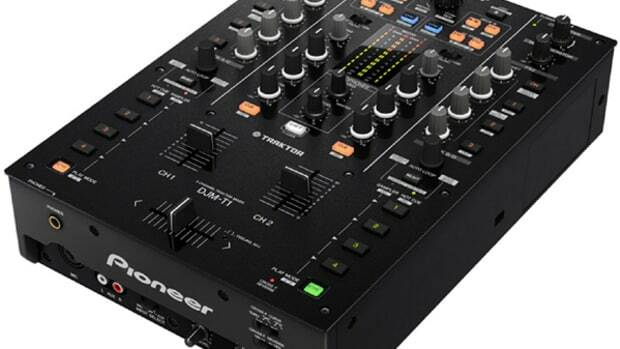 The Pioneer DJM-250 is a small DJ mixer, but it&apos;s big in the right areas. The new two-channel (eight input) Pioneer DJM-250 has cool over-sized knobs Filter knobs for each channel and a silky smooth crossfader for mixing and scratching. Everything on the DJM-250 feels "Pioneer DJ" Strong and it all comes in at a price that won&apos;t kill your wallet. 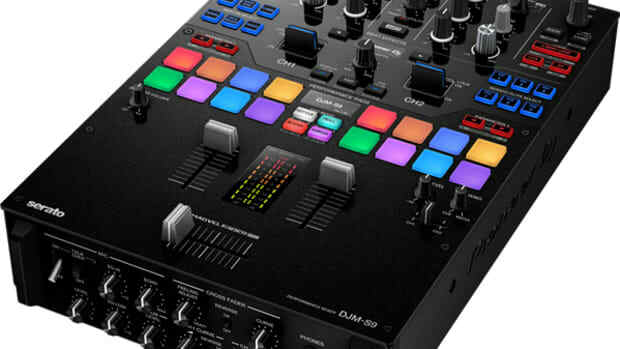 Check out my full HD-Video review to see how this new compact Pioneer DJ mixer stacks up. 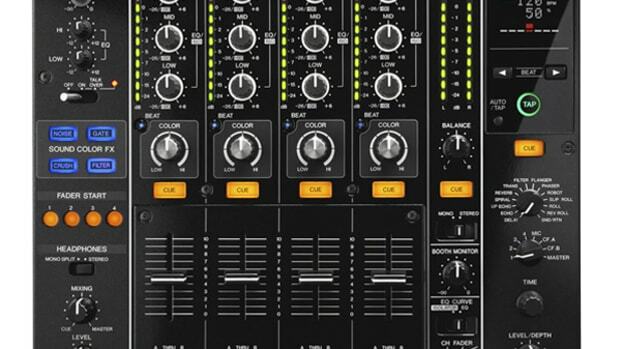 The Pioneer DJM-250 is a solid two-channel professional-grade DJ mixer with some great basic features and a few not-so-basic features that make it stand out from the crowd. 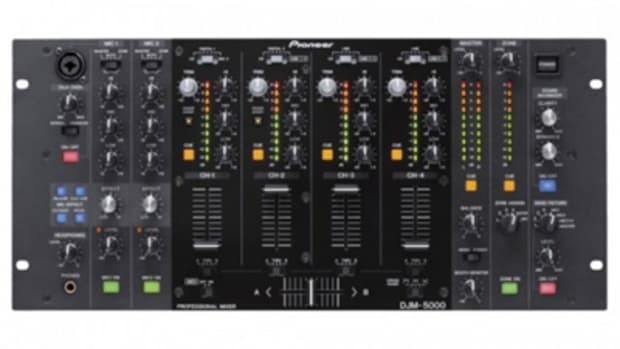 The Pioneer DJM-250 has all of the well-known Pioneer Mixer build quality with a full-metal chassis, sturdy faders, and reinforced knobs throughout. The buttons for fader-start (For CDJ-Decks) and channel headphone cue-ing are all plastic but have a long-lasting feel to them and they all illuminate so the DJ can easily see which button is activated at the current time. The knobs of the Pioneer DJM-250 have a rubberized feel to them and they are thick and comfortable to manipulate. The sound quality of the Pioneer DJM-250 is also excellent with club-like performance throughout our entire testing period. 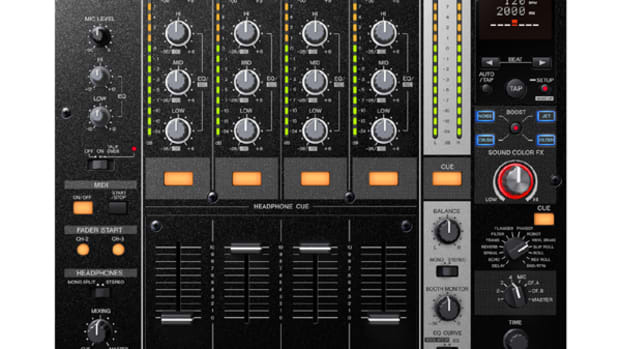 The Pioneer DJM-250 has the basic two-channel mixer layout with all of the controls for channel one positioned to the left while the channel two controls are all to the right. There is the normal Three-Band EQ, Gain knobs, cue buttons and everything else you would expect from a two-channel mixer. Where things get a bit more interesting is with the oversized High/Low Pass Filter knobs (one per channel) that really set this mixer apart from the others. When the filter knob is turned to the left, it engages a Low-Pass filter; when the filter knob is turned to the right, it engages a High-Pass Filter. There is an LED indicator that pulsates to let the user know when the filter is activated. This is an excellent feature and it proved very fun to use during our testing period. It is a pretty basic effect, but those who mix using these filters know just how much of a “game-changer” they can be when used correctly. The Pioneer DJM-250 has a nice set of faders on-board. The crossfader is nice and loose and has a decent cut-in distance (about 1.5mm) making it possible to pull off all those complex scratches when the curve adjustment is set to the sharpest setting. When the switch is set to long-curve mode, the crossfader then becomes a nice mixing option that will fade consistently from one track to the other. The switch can also be set to straight through mode so that the crossfader has no use at all. The crossfader does not have a reverse or hamster function. The linefaders have almost the same loose feeling as the crossfader. It’s worth noting that the linefaders do not have a curve adjustment or reverse mode for those scratch-happy DJ’s out there who need this feature on a DJ mixer. 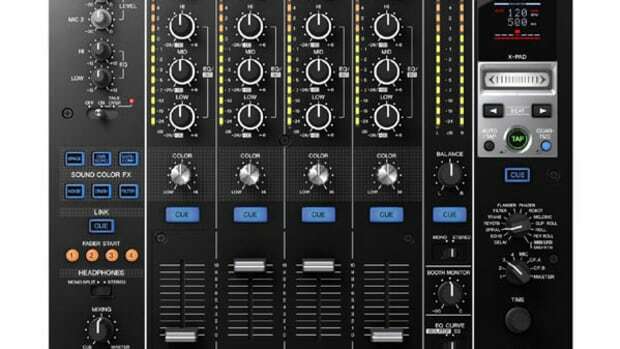 The Pioneer DJM-250 two-channel DJ Mixer has a very healthy set of output and input options at your disposal. On the back you can hook up an incredible EIGHT different sound sources to this tiny two-channel mixer. Each Channel has two different RCA connections with one being switchable between line and phono level. There are a total of three Auxiliary connections (two RCA pairs and a MINI connection for iPod or MP3 playback) and a quarter-inch microphone input around the back. On the top left corner there is a knob so that the user can select which AUX connection or Microphone they would like to use at a particular time. You won’t be able to mix multiple AUX connections since they can only be played one at a time, but it’s cool to know that you will be able to hook up so many devices at one time without needing to disconnect and re-connect other devices when it’s time to switch it up. There were a few minor gripes that I found with the Pioneer DJM-250 mixer. My first issue was the lack of linefader curve or reverse functions. Being that this is a two-channel mixer with a better-than-average crossfader, it’s easy to look at the DJM-250 as a battle-style mixer and it may often be judged as such. Therefore, I believe it would have been nice to include an additional linefader curve adjustment and reverse switch those of us who would like that option. The next gripe that I have with the DJM-250 is the placement of the Cue/Headphone knobs that are located to the left of the channel one linefader. For DJ’s (such as myself) who like to move back and forth from mixer to deck for tricks and different mixing techniques, the knobs for Cue Mix and Cue Volume get in the way of those movements. There is still plenty of room left in the upper right hand corner of the mixer and that would have been a more-logical place to put these Cue knobs since they would have been completely out of the way. 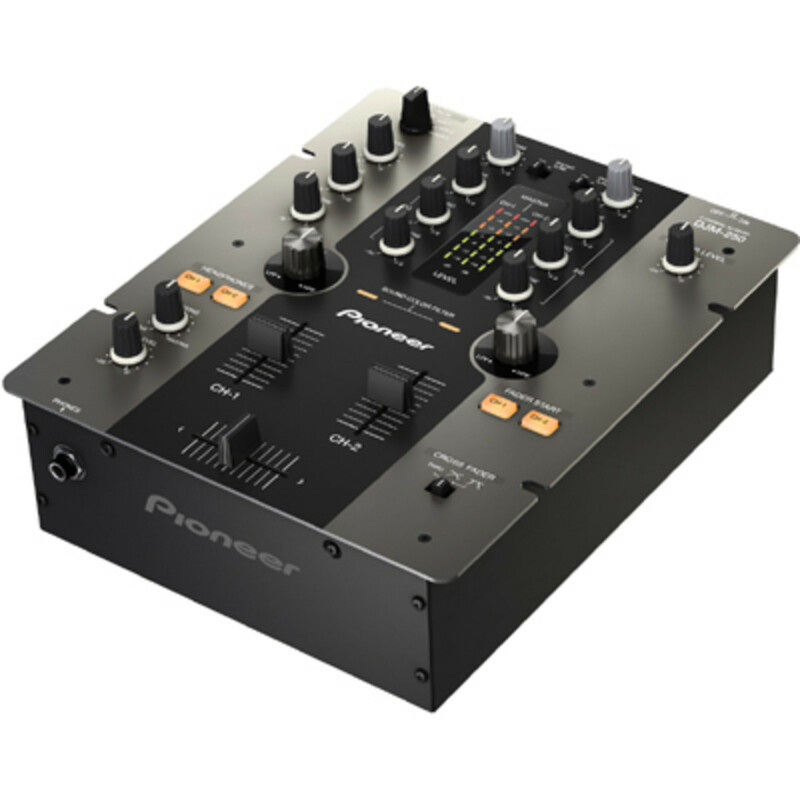 In Conclusion, the Pioneer DJM-250 is a great two-channel Professional DJ Mixer for those looking to get the same build and sound quality that Pioneer is known for without spending an arm and a leg to do so. The DJM-250 has a cool High/Low Pass filter knob for each channel and the Crossfader has a very small cut-in distance, making it easy to pull of the fast scratching fader movements. 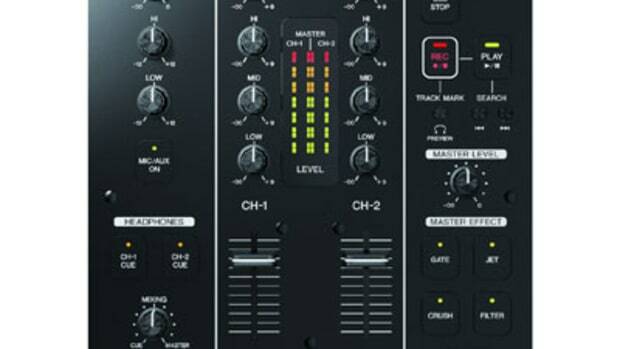 The DJM-250 also has more input/output options than most two-channel mixers out there on the market today. On the downside, the DJM-250 linefaders do not have a curve or reverse adjustment, the placement of the Cue knobs is a bit too close to the channel one linefader controls, and there is only a quarter-inch headphone adapter available to plug in your headphones. 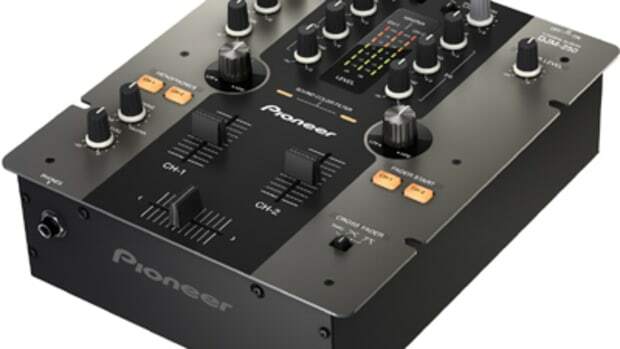 The Pioneer DJM-250 Professional two-channel mixer is recommended to DJ’s who want a small/compact mixer to travel with them when they aren’t at the club playing on the big DJM-Pioneer Mixers. The feel is very similar and DJ’s who play on professional Pioneer Mixers will be right at home. The DJM-250 is also one of the only options for DJ’s who need an on-board high/low pass filter for effects instead of going with a software suite for this feature. I will also recommend this mixer to anyone who needs a nice two-channel mixer that will last them years and years to come.